Whether you’re a cat lover or not, you’re sure to recognise the antics of real life cats in this bright, cartoonish picture book, where the only character in the amusing story is a crazy, orange kitten. It’s a kitten who, upon waking from a cat nap, has a conversation with its tail. Yep, crazy kitten! What ensues is a chase through the bedroom, the bathroom (where it makes a mess of the toilet paper), and an assortment of clothes. It’s there the kitten comes unstuck, getting so tangled in an item of ladies underwear that it can’t see where it’s going. Eventually the kitten finds itself in a cat box with its tail firmly told to stay outside the box. But that’s not the end as the kitten is determined to bring the tail to order. It’s not until the kitten explains to its tail that all it wants is a hug to make it feel better after a scary dream that everything calms down. 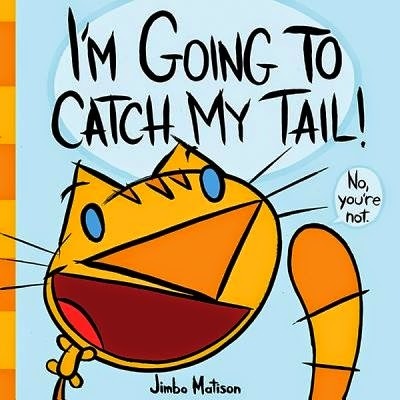 I’m Going to Catch My Tail is written and illustrated by Jimbo Matison who is described as “a happy artist, writer and producer for television and online media.” He also owns an orange cat, which I imagine was the inspiration for this story, his first children’s book.